"The Simpler, the Better" is the perfect description of this alternative to expensive, automatic filters. It is also far more dependable than many intricate filters now available. 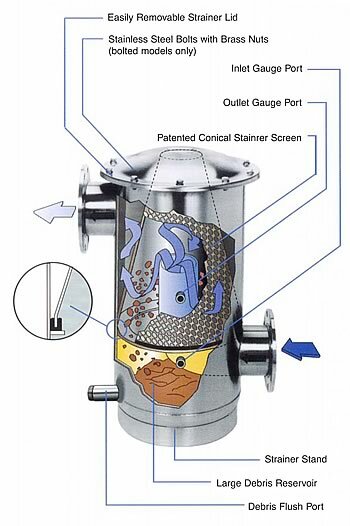 The unique, large conical screen element creates flow patterns that give the MLS Series filter a self-cleaning ability and the advantage of operating at maximum efficiency on less horsepower energy. There are no devices like spinners, torpedoes, drive units or even electricity which may cause an unacceptable pressure loss. Maintenance is low, output is high and pressure loss is at an absolute minimum. 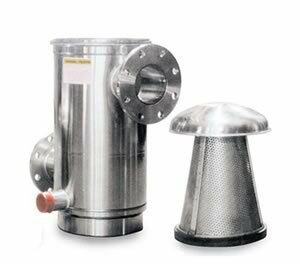 Made in the USA to USA tolerances, the MLS Series filter is a durable, compact, stainless steel filter that can be manifolded to suit any flow rate requirements. Self-cleaning principles are achieved when water flows through the conical screen interior. Debris is effectively forced to the bottom reservoir for easy removal through the flush port. The MLS Series filter retains debris without creating blockage or pressure loss. The innovative, patented design achieves exceptionally high output with only 2 psi or less loss under normal operating conditions. This incredible efficiency results in less energy requirements and ultimately reduces operating costs. 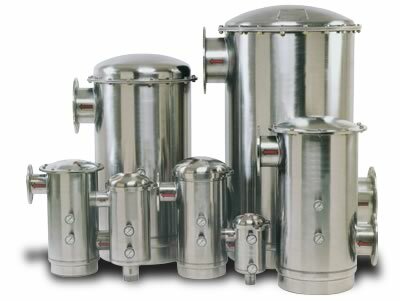 The MLS Series filter models require less space than most filters and are available in six sizes: 2", 3", 4", 6", 8", and 10". With flow rates up to 2,000 GPM, higher flows may be achieved by manifolding multiple filters. Working pressures up to 150 PSI. Screen meshes from 16 to 150. Finer meshes are available upon request. Can be manifolded to increase flow rate. No minimum gallon per mminute requirements. Additional mesh sizes are available upon request. For more information about the MLS Series Filters call the Advantage Sales Department at 317-887-0729. Would you like to Download FYI #169 to your browser?